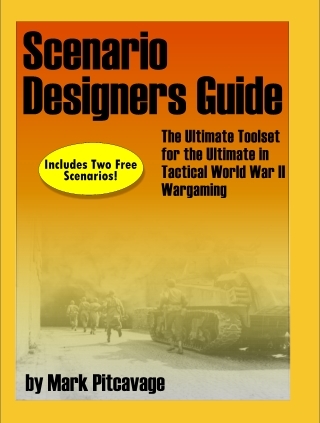 The Scenario Designers Guide is one of the most incredible products ever designed for the ASL player! This huge 72-page manual provides everything you need to know in order to start designing your own ASL scenarios! From conception to research to design to playtesting to publishing, the Scenario Designers Guide gives you expert advice and guidance and makes scenario design a snap! If you have never tried designing scenarios, you have been missing out on one of the most fun aspects of ASL! The Scenario Designers Guide makes it easy. It also includes valuable appendices such as Victory Condition and Scenario Special Rule compendiums. If that weren’t enough, the Scenario Designers Guide includes two FREE scenarios. These fun, challenging tournament-sized scenarios take place on the island of Java at the end of World War II. One scenario features the last independent offensive by the Imperial Japanese Army! The other, even more exciting, features British and Japanese troops fighting together on the same side! These scenarios are MUST-HAVE scenarios for any ASL collection. The Scenario Designers Guide is one of the most useful, interesting, and helpful ASL products ever. It continues the Desperation Morale tradition of offering tools and resources for the ASLer. Don’t miss out on your chance to get the Scenario Designers Guide now!!! The Scenario Designers Guide can be ordered via credit card or Paypal. It will be shipped directly from the printer to your doorstep. Indonesian Order of Battle. Remove 1 3-4-7 squad.